hein added a comment to D20569: RFC: Use more compact OSD. Personally I'm not a big fan. I think the square OSD has more character and visual flair. The change proposed here looks rather cramped and removes some identity from the system. hein accepted D20469: Add DesktopEntry to notifyrc. hein accepted D20494: Add DesktopEntry to notifyrc. hein accepted D20428: separe mobile text selection to avoid recursive imports. hein committed R32:5e17ba4cd7a5: Fix build on Qt 5.13 branch (authored by hein). hein closed D20419: Fix build on Qt 5.13 branch. hein accepted D20420: [Folder View] use Math.floor() instead of Math.round(). hein committed R242:846741f851c6: Revert "use the right namespace" (authored by hein). Revert "use the right namespace"
hein added a reverting change for R242:067ec2eafcbe: use the right namespace: R242:846741f851c6: Revert "use the right namespace". hein added a reverting change for R242:c72ee78bbbc4: mov the mobile text actions in own import: R242:a280cccfde66: Revert "mov the mobile text actions in own import". hein committed R242:a280cccfde66: Revert "mov the mobile text actions in own import" (authored by hein). Revert "mov the mobile text actions in own import"
hein requested review of D20419: Fix build on Qt 5.13 branch. hein added a comment to D20407: [Folder View] Improve label crispness. I think it would be safer to Math.floor() rather than Math.round(). hein accepted D20370: [Folder View] Implement a user-configurable setting for label width. hein accepted D20368: [Folder View] Use a more reasonable minimum cell width. hein committed R917:45b2366d352a: Update the member roster for the FiWG (authored by hein). hein updated the diff for D20237: Port to new KWorkspace API. hein added a comment to D20237: Port to new KWorkspace API. Personally I tend to prefer just readable, explicit code for simple cases. hein accepted D19874: [Kickoff] Reduce the margins of KickoffItem, KickoffHighlight and use smallSpacing. @hein what's your opinion on reducing the margins? hein added inline comments to D20237: Port to new KWorkspace API. Do some cleanups suggested by Kai. hein added a dependent revision for D19389: [WIP] Rewrite kworkspace logout, shutdown and suspend API: D20237: Port to new KWorkspace API. hein requested review of D20237: Port to new KWorkspace API. hein accepted D19873: [image-wallpaper] Port to Kirigami.FormLayout and use twinFormLayouts. hein added a comment to D19926: Add Bookmark Handling. Suuper good question that I also don't have a really good answer to :( But it's always super good when a project figures out how to answer it (e.g. Krita took off after it made a call to be a painting app). for it back" argument is strong. Because Konqueror was also unpopular enough to get replaced by Dolphin and to end up largely unmaintained (although it is still released and available). To me that indicates that becoming more like Konqueror may actually be the wrong direction. hein added a comment to D19822: [Task Manager] Toggle mute when the audio indicator is clicked. About the icon issue, IconItem by default uses the icon theme overlay from the Plasma theme, Kirigami.Icon will use the regular Plasma icons. That's kind of tricky - with Breeze we could totally make them match, but other Plasma themes would have issues. hein added a comment to T10755: Unifying Applications' release versions. Sure, why would the release team bump an individual app version if it wants to follow a random scheme? hein added a comment to D20205: initialize the kcolorscheme at the first app start. Or the QPA could look at the LnF in the first place instead of kdeglobals? That just seems to describe how you can make your app follow the KDE Apps YY.MM version number, not how Release Team can bump an individual app version number. Looks like we have a subtask: Make sure all apps in "KDE Applications" store version numbers in a unified place, even if the version is not being bumped by script. But bumping version numbers is a technical problem that can have a technical solution. The Places panel is really for frequent and immediate access whereas bookmarks are more for long-term organization. On the other hand, having the release team take care of all of this stuff automatically and on a predictable schedule is really nice. Hang on, isn't this kind of redundant with Places? So version ‘3.6’ can mean a number of different versions, each with its own sets of bugs and features. I don't find being part of KDE Applications releases very compelling for many of my apps. The reasons vary - some are alternatives to other apps in the bundle, some don't act in concert with anything else in the bundle, it means sharing attention with many other things (in two ways - public attention, but also dev attention: many things have to be spun up and be ready for release simultaneously, which is inconvenient), it means no ability to set my own schedule. Again you can't have a full list on the announcement with 215 names and version numbers, it's just not feasible. I think then we'd have to rethink the way we promote, which could also be a solution. I.e. stop having a version number for KDE Applications entirely, instead of having a YY.MM we just make a "KDE updates apps today" announcement on some day, and the announcement includes a full list with individual versions. If we don't want it to be used, why have the number? hein added a comment to D19873: [image-wallpaper] Port to Kirigami.FormLayout and use twinFormLayouts. Looks solid to me. Is your concern re vertical spacing still valid? My gut reaction was to agree with @ltoscano whole-heartedly, but the more I think about it that stance does have awkward unsolved problems. hein committed R119:dcb4c158b414: foldermodel: store information about screen used (authored by McPain). hein closed D18979: foldermodel: store information about screen used. hein added a comment to D18979: foldermodel: store information about screen used. hein added a comment to D20189: Change default Yakuake skin to breeze compact. Looks pretty nice to me. I have no objections. hein accepted D18979: foldermodel: store information about screen used. Thanks! Do you need help landing this? hein added a comment to D20093: Show a context menu on pressAndHold. I guess this brings us back to the old debate of a generic solution vs. patching all the UIs. I'm inclined to agree with this approach because it should probably be up to the specific UI what it wants to happen on the gesture. hein updated subscribers of D19822: [Task Manager] Toggle mute when the audio indicator is clicked. rooty, your behavior in this thread has been extremely aggressive, disrespectful and uncollaborative. I'd like to ask you to stop at this point and not participate futher, as well as in any future threads related to the Task Manager applets. As for options overload, based on the reasoning above and the fact that we've recently split up the options and that we have space, I don't agree that this should be approached through the prism of UI clutter. hein requested changes to D19822: [Task Manager] Toggle mute when the audio indicator is clicked. This is a specious argument. I'm not a fan of the checkbox, I think it's a little gratuitous. If you add a small feature and need to immediately add a checkbox to disable it, it's rather a red flag to me. It means either the feature or the checkbox should probably go. Firefox gets away without the option BTW. hein accepted D19835: [Yakuake] Improve customization. hein accepted D19096: [Kicker] Fix "Tooltip can not be displayed". Yeah, this looks fine, thanks! hein committed R857:17d5e8085b2c: Fix Windows build tools ending up in .apks (authored by hein). hein accepted D19833: Remove double scrollbar in appearance settings. hein accepted D19800: [Application Dashboard] Improve mouse handler. hein accepted D18438: [Task Manager] When closing apps, resize only when mouse is out..
hein added a comment to D19829: kicker: add option to make root level icons visible. Kicker intentionally doesn't have icons on the root level to not conflict with the favorites column and reduce visual noise. hein added a comment to D19744: [taskmanager] Fix desktop file mapping for some apps. What's the name of the .desktop file though? That's the most relevant part. hein accepted D19647: [sddm-theme/lock screen] Use QQC2 for the clock labels. hein accepted D19751: [Pager] Shrink label font size dynamically. hein requested changes to D19744: [taskmanager] Fix desktop file mapping for some apps. Sorry, that's too fast and loose for me. hein accepted D19606: [Task Manager] Reorganize and improve presentation of context menu. hein added a comment to D19237: [Yakuake] Use the svg icons instead of the png icons for the default theme. Also, maybe we can just delete the .png files then and make the tarball smaller? hein accepted D19237: [Yakuake] Use the svg icons instead of the png icons for the default theme. 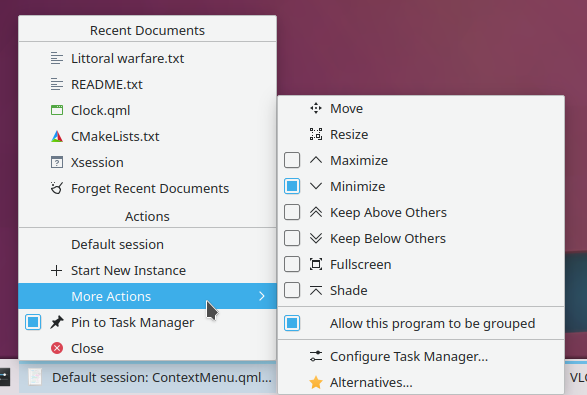 hein added a comment to D19606: [Task Manager] Reorganize and improve presentation of context menu. hein committed R857:d997974fd4e8: Do shallow clones (authored by hein). hein committed R857:e941a2e2f0c6: Always pass PREFIX to qmake (authored by hein). hein committed R119:3fc5abe1c0aa: Merge branch 'Plasma/5.15' (authored by hein). hein committed R120:169238848136: Merge branch 'Plasma/5.15' (authored by hein). hein committed R120:53290043796c: [Task Manager] Fix sorting of tasks on last desktop in sort-by-desktop mode (authored by hein). hein closed D19259: [Task Manager] Fix sorting of tasks on last desktop in sort-by-desktop mode. hein committed R119:4d0f1a3e6ec7: Make Ctrl+A work regardless of focus and visualize active selection in search… (authored by hein). hein committed R119:d769b7aa8838: [Task Manager] Fix virtual desktops subtext on task tooltip (authored by hein). hein closed D19518: Make Ctrl+A work regardless of focus and visualize active selection in search heading. hein closed D19257: [Task Manager] Fix virtual desktops subtext on task tooltip. hein committed R169:31e91fbbf7f5: kirigami_package_breeze_icons: Search among size 16 icons as well (authored by hein). hein closed D19688: kirigami_package_breeze_icons: Search among size 16 icons as well. hein requested review of D19688: kirigami_package_breeze_icons: Search among size 16 icons as well. hein added a comment to D13335: Fix Skin validation when installed from KNS. Boom! Landed it for you. Sorry this took so long! hein committed R369:d9537fcba90b: Fix Skin validation when installed from KNS (authored by chauvin). hein closed D13335: Fix Skin validation when installed from KNS. I'm concerned that having title labels on everything could be overdoing it a bit? It makes the context menu very large and have a lot of dead space, and adds to the noise. Isn't that rather a detriment to utility on repeated use? It's sometimes important to remember new users don't stay new users for very long, and first-time use isn't the only experience to optimize for. hein added a comment to D19096: [Kicker] Fix "Tooltip can not be displayed". ... I'll need to set some time aside to analyze what you're trying to achieve there and propose an alternative. Display 2 lines for long labels. For labels need more than 2 lines -> display a tooltip that has the full label when hovering on it. Can you explain more what this is trying to achieve / what it solves with an example? hein added a comment to T10561: Mozilla collaboration. Note: This is a very broad/community-sweeping intiative (the ideas here touch on many teams and even the e.V. ), and as such it's important that it doesn't stay bottled up inside just Promo - please make sure this finds it way to the kde-community list well before concrete actions are taken on a global scale. Promotional work is just a small aspect of what's being proposed here. I'm sorry, but I can't accept this patch as-is - the hoverArea-related changes are just wrong, it's not OK to couple a delegate to the view by making it set tons of property on an item i its parent. I'll need to set some time aside to analyze what you're trying to achieve there and propose an alternative. hein requested changes to D18438: [Task Manager] When closing apps, resize only when mouse is out.. Almost! This is not going to work reliably for groups, because the order in which their children are deleted is up to the client processes. That means once a group goes from two to one and morphs into a regular task item, the window id it has might not match the winIdList you previously recorded. Instead, you should store the entire winIdList, and when an item is removed check whether it's winIdList is in the list you saved away. You also need to do a bounds check before you access  though because not every task has a window id (e.g. launchers and startup notifications), so you're causing errors ATM. hein accepted D13335: Fix Skin validation when installed from KNS. hein committed R888:293c906ae7a9: Merge branch 'master' into realmaster (authored by hein). hein committed R888:cd73219b59a3: Adjust for v1.0.12. (authored by hein). hein committed R888:c8b6de6a5670: Always sort alphabetically (authored by hein). hein committed R888:e1ae8b34befe: Performance optimizations; minor cleanup; adjust for v1.0.11 (authored by hein).